Sensitive people often find things hard in real life. They live and feel intensely and are deep thinkers. Most sensitive people have high emotional intelligence, and they recognize and understand feelings in a different way. Sensitive hearts are unique. They are capable of turning pain and darkness into something real, sentimental and worth remembering. 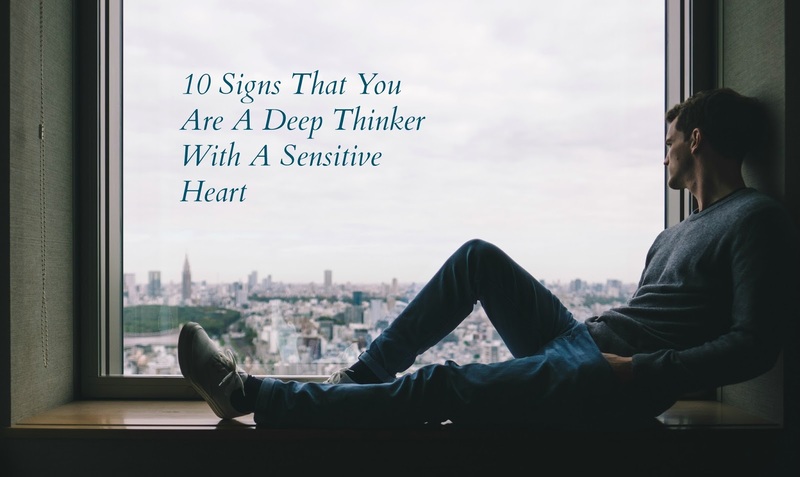 Most sensitive people overthink and are extremely harsh on themselves. They never forgive themselves for anything and are also really empathetic. Emotions are second nature to them. Deep thinkers will discover meaning in everything they see, hear and feel. Sensitive hearts frequently find the meaning behind life's lessons and learn to search for answers to most questions asked in life. Most sensitive people listen very carefully, but sometimes they hear things they want to hear or things they're afraid of hearing. It is part of their personality to listen carefully and, often, effortlessly. Deep thinkers cannot settle for gray. They don’t know the word 'almost' so they have to choose either this or that. They either love you completely, or they don’t at all. The majority of deep thinkers will give you all their love and expect you to love them that way in return. If you don’t reciprocate, they can become mad. Deep thinkers have a perfect idea of what the world should be like. That's also related to what they wish for other people to be. That's why they often get disappointed. They cannot take life easy; they are indecisive and usually nervous. They are in a constant search for utopia and believe in virtues unknown to most people. Highly sensitive people have a safely tucked away secret that they don't even know about. They feel connected to life but not with the people around them. That's why they often feel like they're isolated. It's very hard for them to feel like they belong in a social group. Their heart is fragile. They're usually romantic and hopeful that true love exists. They need affection and understanding. They frequently shut themselves off from the world and need some time to heal. It's too difficult for them to express their true feelings for someone. Deep thinkers have a special relationship with the universe. They are deeply connected, and this bond is strong and spiritual. Sensitive hearts like to live in their own world. They also care about nature and the world's elements. Deep thinkers go to bed late as they find it hard to sleep. Their mind won't hush it, as it's full of thoughts, fears, and questions about everything. Deep thinkers love their freedom and don't let anyone tell them what to do. They like to be independent and have plenty of time for themselves. They are never seeking external satisfaction by others; instead, they make plans that suit them even if it means being on their own.